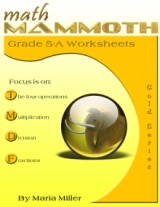 Math Mammoth Grade 5 Worksheets - two reproducible math workbooks for 5th grade. 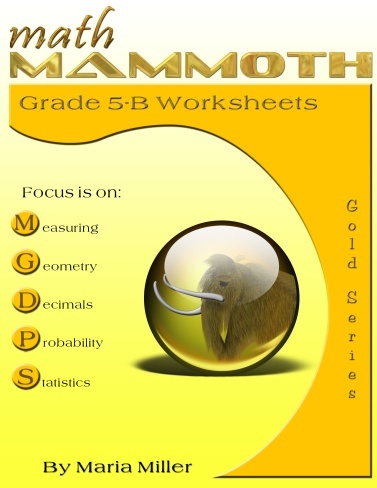 Math Mammoth Grade 5 comprises two workbooks, 5-A and 5-B, covering all 5th grade topics. The worksheets have been created especially for teachers: each problem sheet is one page, concentrating on one topic. These sheets are not any ordinary "drill and kill" worksheets but "hand-crafted". The problems both emphasize understanding of concepts and practice computation, with variable word problems. In the fifth grade book 5-A, addition and subtraction finally take the back stage after the earlier grades. 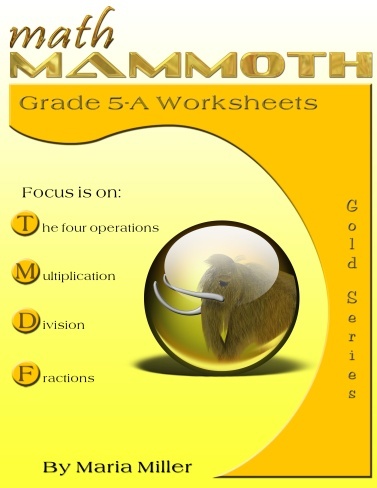 In the first section of these worksheets, students review and study further all four operations, the order of operations, place value, time calculations, and some applications such as money and word problems about fractional parts. In the multiplication / division section (book 5-A), you will find worksheets for long multiplication and long division with bigger numbers, including a two-digit divisor in long division. Next come number theory topics, such as factoring, where students can apply their knowledge of multiplication and division, and prepare for fractions. Fraction topics are in focus in 5th grade. Equivalent fractions, addition, subtraction, and simplifying are studied in great detail. Multiplying and dividing are mostly left for 6th grade, except for the easy "mental math" situations where a fraction is multiplied or divided by a whole number. There is still a lot of emphasis on visual models and problems with pictures. In book 5-B, measuring worksheets present metric and customary systems 'side-by-side' so that students practice both at the same time, and can easily understand which units belong to which. Geometry worksheets cover a variety of topics, such as angles, quadrilaterals, congruency, and drawing various polygons. In 5th grade, students learn the concept of volume, and understand the difference between perimeter, area, and volume. There are many worksheets covering these topics. The worksheets for decimals use first only tenths and hundredths (decimals up to 2 decimal digits). The problems in these worksheets address especially the students' understanding of decimal place value so that they do not make a mistake such as 0.3 + 0.04 = 0.7. The first multiplication and division worksheets have only mental math problems. Then, thousandths are introduced, and the worksheets cover topics such as comparing, rounding, multiplying, and long division with decimals. Probability is briefly covered with two worksheets. Statistics problem sheets are very varied, hopefully catering for all. On my other website, you can generate additional, free 5th grade math worksheets to supplement this book.